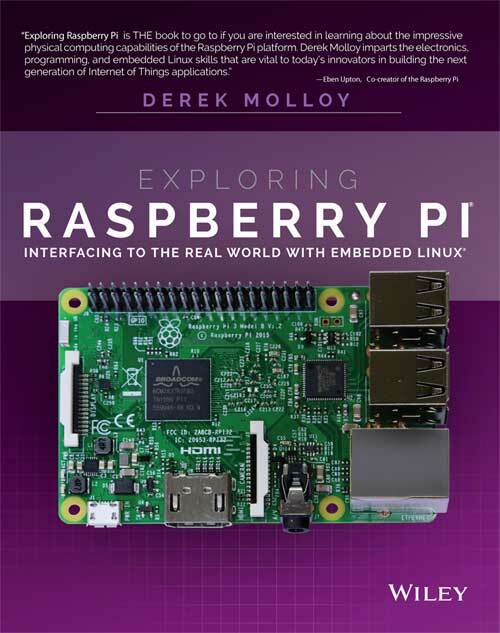 This is the companion site for the book “Exploring Raspberry Pi: Interfacing to the Real World with Embedded Linux” by Derek Molloy. It is maintained by the author and it contains supporting digital downloads, video, and source code examples. The website also contains additional materials that are too specific to include in the book. Each chapter in the book links to an individual web page (e.g., /chapter1), which can be accessed using the drop-down menu on the top right-hand side of this page. Please also see my other book website on the BeagleBone Black. Exploring BeagleBone is a hands–on guide to bringing gadgets, gizmos, and robots to life using the popular BeagleBone embedded Linux platform. Comprehensive content and deep detail provide more than just a BeagleBone instruction manual—you’ll also learn the underlying engineering techniques that will allow you to create your own projects. The book begins with a foundational primer on essential skills, and then gradually moves into communication, control, and advanced applications using C/C++, allowing you to learn at your own pace. In addition, the book’s companion website features instructional videos, source code, discussion forums, and more, to ensure that you have everything you need. How does this book compare to Exploring BeagleBone? Paperback and Kindle versions available Worldwide. 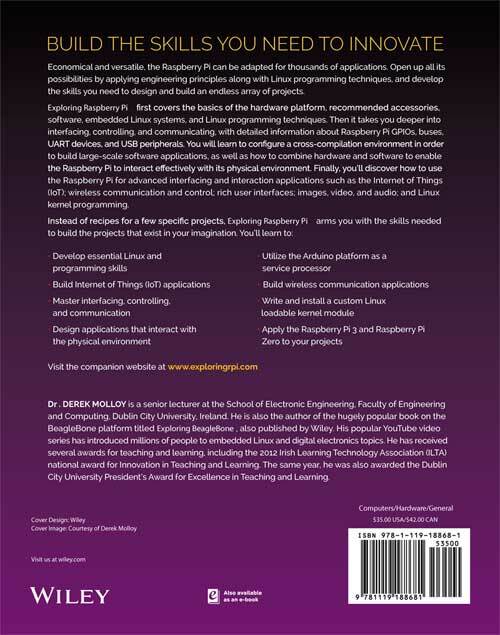 All of the source code that is described in this book is available in a public GitHub repository: Derek Molloy Exploring Raspberry Pi repository. You can also install a Windows GitHub desktop application or a Mac OS X GitHub desktop application. Alternatively, you can download a full ZIP archive of the code using the following link: Download Source Code (this is a live link that automatically provides you with the very latest files). Economical and versatile, the Raspberry Pi can be adapted for thousands of applications. Open up all its possibilities by applying engineering principles along with Linux programming techniques, and develop the skills you need to design and build an endless array of projects. Exploring Raspberry Pi first covers the basics of the hardware platform, recommended accessories, software, embedded Linux systems, and Linux programming techniques. Then it takes you deeper into interfacing, controlling, and communicating, with detailed information about Raspberry Pi GPIOs, buses, UART devices, and USB peripherals. You will learn to configure a cross-compilation environment in order to build large-scale software applications, as well as how to combine hardware and software to enable the Raspberry Pi to interact effectively with its physical environment. Finally, you’ll discover how to use the Raspberry Pi for advanced interfacing and interaction applications such as the Internet of Things (IoT); wireless communication and control; rich user interfaces; images, video, and audio; and Linux kernel programming. Dr. Derek Molloy is a Senior Lecturer in the School of Electronic Engineering at Dublin City University, Ireland. Derek produces a popular YouTube series on the BeagleBone platform and a wide variety of embedded Linux topics. His videos and personal blog have introduced millions of people to the BeagleBone, embedded Linux, and digital electronics. See the About the Author page for more information. Dr. Tom Betka came to the world of embedded systems development by way of a previous career in the aviation industry, and then as a physician practicing clinical medicine for well over a decade. During this time his love of computers and software development evolved toward the field of embedded systems, and his training in computer science culminated in a second undergraduate-level degree. After leaving clinical medicine, Dr. Betka began working in the world of software development and has served as a subject-matter expert in both medicine and embedded systems for various companies in the industry. His recent work has included projects at the NASA Kennedy Space Center and the Sierra Nevada Corporation. Tom’s first love is the C-family of programming languages and using these languages to program 8-bit microcontrollers. As a Linux user for the past decade, he has also been working with the BeagleBone, BeagleBone Black, and Raspberry Pi devices for the last several years as well. His hobbies include advanced mathematics, aviation, high-powered model rocketry, and robotics. Also, he can often be found building prototype devices in his home-based machine shop. In a previous life, Tom worked for several years as a professional drummer—and was one of the first in his area to embrace the use of electronic percussion devices in live music scenarios. Molloy, D. (2016). Exploring Raspberry Pi: Interfacing to the Real Wold with Embedded Linux. New York: Wiley, 978-1119188687, 720pp. The “Download Source Code” link is for the beaglebone. It should be “https://github.com/derekmolloy/exploringrpi/archive/master.zip”. Thanks Jim, I fixed that link. Derek. Is there any error with the link ? I will add a note to the webpage. Thanks for letting me know, Derek. What a great book!. I’ve been looking for a book at this quality level and detail for a while on the Raspberry Pi. It is highly likely I’ll use your book for my Embedded course next year. Thanks Andrew, I will be too 🙂 Derek. Very detailed book. Could you provide an example parts page similar to the one you made for Exploring the BeagleBone? Would help. Hi Charles, apologies for the delay. That is now on my list of things to do as it would be very useful for readers. Thanks, Derek. I bought a copy yesterday because some of the chapters looked promising. I am pleasantly surprised, I am still in the early chapters, but this is one of the best written Linux guides I have read, and the Pi specific insights excellent. I will be recommending this book. There are a couple of points I disagree with. The book repeats some of the Urban Myths circulating in Pi circles. The GPIO pins can safely supply 16mA. There may be a limit to the total current the GPIO can source, but does not seem to be documented. I believe the source of the 50mA was Gert’s comment “The raspberry-Pi 3V3 supply was designed with a maximum current of ~3mA per GPIO pin. If you load each pin with 16mA the total current is 272mA. The 3V3 supply will collapse under that!” 3*17 => 51 mA. Hi there. Thanks for the great feedback. I’m afraid that I too struggled to find an answer to that issue. Broadcom has not provided a datasheet with the technical specifications necessary to answer this question definitively. As such, I had to err on the side of caution. You will see that I avoid drawing or sinking any significant current from/to the GPIOs throughout the book by using FETs/BJTs — I think this is the safest approach. Thanks again, Derek. Great book!. Incredibly useful!! I made a prototype of my project using Raspberry Py, but now, I would like to use one industrial board to make more quantity. Could you recommend me one? At least, I need 1GHZ and 500MB RAM. The first smart toaster of the world!! Hi Enrique, Super work and very impressive toaster! You could look at the BeagleBone for the final version. In particular, have a look at the Octavo 3358 (http://octavosystems.com/2016/05/09/osd3358-new-era-integration/) which should greatly simplify a product roll out with the spec that you need. Kind regards, Derek. Thank you for such a wonderful book. I am a newbie to this topic but found your book by way of an Amazon recommendation after purchasing a Pi 3. My background is in Operational Technology, supporting PLCs, control panels, instrumentation and HMI in the water and wastewater environment. MQTT and the IIOT has my curiosity looking to find a better way for remote monitoring. Custom I/O, Surveillance and remote control by combining new technology with existing platforms. I am looking forward to learning more from your book. Thank you. Thanks Steve, that is great feedback. Derek. I am now getting into more of the hardware integration in your book Exploring Raspberry Pi. I tried to download the devmem2.c file from the http://www.lartmaker.com site, but it is refusing connection. This seems like a very useful tool and I am wondering if you have this file available at some location on the web. If you don’t, then emailing it might be an option. I appreciate your help. It looks great again Derek! 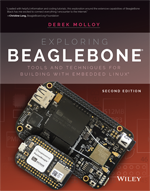 I’m a big fan of your Exploring BeagleBone Book and the supportive website which is fabulous on its own. I appreciate your engineering approach to the platform, its more suitable for me personally. I ordered the RPi book more as a curiosity but I found myself ordering a new Pi 3 as well.. Now looking forward to both! I love your book and have recommended it to others. Please delete my last comment (awaiting moderation), I figured out the issue. printf “%d.%02d\n” i2cget -y 1 0x55 0x00 i2cget -y 1 0x55 0x01 does not work, gives errors but in Python, this works. Have worked on embedded control systems, 8085, Atmel . Was exploring Raspberry PI. This is really a great book. Thank you some much for putting all together. Is it possible to buy the pdf version? Hi – Purchased your Exploring Raspberry PI book and am working through the hello.ko install. No problems with getting the make file to create the module files. However, I received the following error when trying to install the finished hello.ko Last step in the process. The source I downloaded is linux-rpi-4.9.y I’m thinking this is an incompatible version problem? But the source and current kernel appear to be the same. Confusing. Which worked. If you enter the linux-rpi-4.9.y directory there is a README file. Starting at line 146 you’ll see all the make options. In the newer linux version I was unable to find (in /proc) the .config or config.gz files. I gather this has changed since 4.1.12-v7+ Also when assigning KHEADER=’pwd’ you’ll want to use KHEADER=$(pwd) Same for the ‘uname -r’ Use $(uname -r) instead. Otherwise all is well. Hope this helps a few out there. Thanks for the book, I have made it to Chapter 5 and I am mainly (90%) enjoying it; so far it is my favourite option. The only downside is that I am having problems with the examples that access the GPIO in C.
As an example, the makeLED programme in Ch05, which fails to compile under C at line 38; reporting ” makeLED.c:38:7: warning: implicit declaration of function ‘usleep’ [-Wimplicit-function-declaration] usleep(100000); // sleep for 100ms. requiring the inclusion of to allow compilation. I assume that my issues surround the programming differences between the various RPi’s; personally I am using an RPi 3, running Raspbian Version 9 (“Stretch”). In an endeavour to fully progress through your book, could you confirm which RPi and software the book was actually used for testing the programmes? My aim is then to configure an identical RPi, to complete the book and then explore the GPIO programming across the versions. I must confess that it is this variety of GPIO configurations that is confusing me, (and probably many other readers) and any help would be welcome. As of the November 2016 release, Raspbian has the SSH server disabled by default. You might want to add information around page 30 to tell new users how to enable ssh. Refer to the following link. Great book by the way! I just got the Raspberry Pi 3B, and plan to go through your book to familiarize myself with the capabilities and uses of the device. Do you recommend installing Stretch or Jesse as the better platform for the code examples in the book, or are both equally compatible? // Writing the 000 is not necessary but is there for clarity. At my side this command doesn’t work properly without sudo: all addresses are ‘0’, but once with sudo, it becomes Ok.
Hello! I will start studing Raspberry. Is it possible to use the book with Raspberry Pi 3 ?